Heaven on Earth? Is It Possible? 04-09-17 Heaven on Earth? Is It Possible? Description: Well, this family seems to think so. Meet Children’s Book Author, Monica Iglesias and her children, the characters in her books. They are actively co-creating heaven on earth first in their hearts, then in their home and expanding out to everyone they meet and everywhere they go. Creating a beautiful ripple in the world. They are no strangers to pain, disharmony and discord. In fact, they lived in dysfunction, control, abuse, and manipulation. But they have been able to shift and transform their family dynamics and are now each taking an active role in consciously creating the life they choose to experience individually and together, the children along with their parents. Hear their inspiring and transformational story from abuse to powerful creators of Love, Peace, Joy, Connection and so much more. This family is empowering children and families worldwide to consciously create the heaven on earth they seek. Their desire is to share the magic of the power within. Bio: After being raised in abuse, Monica became the abuser. She knew she had to change and poured out her soul for heaven’s help. Since then, she has been able to break the cycle of control and abuse by discovering the value within herself and ways to empower the children in her stewardship, transforming her life from victim and blame to powerful creator. When asking how she could be her highest contribution to the world, the answer came to share her children’s stories. Sharing her knowledge and wisdom to empower others is one of the highlights of her life. 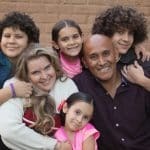 Today, in addition to being a wife and mother of four, Monica Iglesias is also an Inspirational Children’s Book Author, Speaker, Mentor, and Angel Intuitive. She lives her passion and purpose by guiding others through their own personal transformations, angelic connections, and teaches mothers how to empower the children in their stewardship.